These two little newborns are no new species discovered! They are ‘Albino Pygmy Monkey Twins’. These photographs are taken shortly after their birth. Exceedingly rare, they have hit the headlines not for their being twins, but because they’re albinos (deficient in pigment). 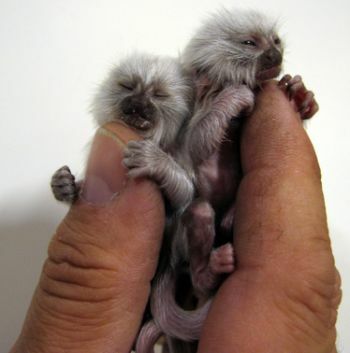 Pygmy marmosets are typically born in pairs. Disgraced scientist tried to clone mammoth! ← Shame on Madonna! Is shooting out 1,000 baby pheasants' brains a sport?